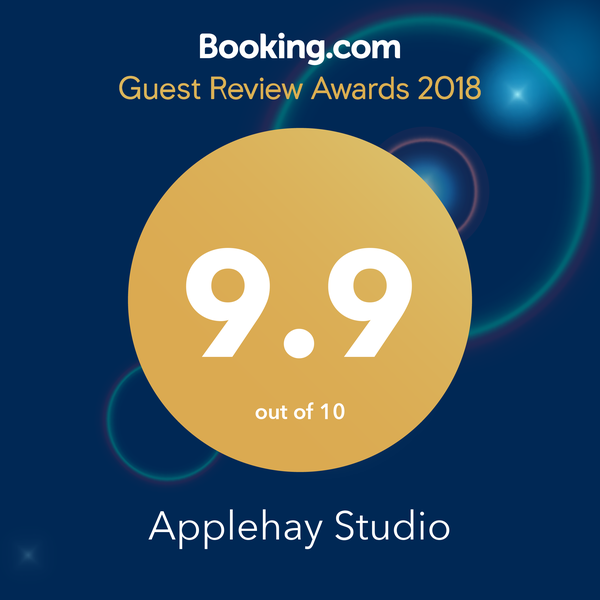 Message: We booked Applehay Studio after seeing the many positive reviews and photos and as base for exploring the Dorset region. But it was even nicer than we imagined! The hosts could not have been more welcoming and friendly, and the studio is private, quiet, spotless, comfortable and full of charm, as is the tiny village of Semley where it is located. The drive to and from the village each day turned out to be part of the fun, as the area is filled with picturesque country lanes and villages, and yet Shaftesbury is only minutes away. Right next door to the studio is a great little boutique food market that has a great selection of items for breakfast (including freshly baked croissants!) and picnic lunches. We would love to stay there again except longer next time. Highly recommended! Message: Hi Jo Just to say thank you for your hospitality, Rod and I really enjoyed our stay. Applehay Studios were really well situated for exploring, and very well equipped kitchen and living space. Would recommend to our friends. Message: Decided to book Applehay studio after reading the wonderful reviews left on Tripadvisor. I phoned direct to the owners and spoke to Jo and booked over the telephone. We arrived at the studio and was greeted by Jo and Alan who gave us a quick tour of the property and gave us some information of where to eat locally and to wish us a pleasant stay. Our first impressions were WOW it is a spacious, well appointed studio very clean and everything you need for a lovely stay away from home. The spiral staircase really added to the charm of the place. We had two great nights sleep on a comfy clean bed which when the lights are turned off is in complete darkness, which I love. The bathroom which is located downstairs has a fantastic shower with shower gel included lovely white fluffy towels and plenty of loo roll. The kitchen was well equipped with everything you need to cook, if you want to. We didn't as I wanted a nice relaxing break so we ate out instead. Whilst we were there we were fortunate enough to attend Semley village fete, which was lovely and in the evening there was a band on the village green. We had a wonderful stay in a lovely place with wonderful hosts will definatley recommend to family and friends. Message: A perfect place to stay very relaxing, location is perfect for coast and countryside, lovely to come home to from long days of sightseeing. Durdle Door fantastic. Thank you Jo and Alan, you have a lovely place. Message:What a lovely find, have been a couple of times and found it a fantastic place to stay, very clean and comfortable. Lots of places to visit if you feel like it, or the pub over the road the Bennett Arms, very welcoming. The hosts of Applehay studio Jo and Alan made me feel most welcome, they are lovely people....will definitely be back for more peace and quiet. Message: What a wonderful find! Felt relaxed as soon as we were welcomed and walked through the door. Studio very comfortable and well thought out. Thank you for a lovely stay. Message: Thank you for making our stay very enjoyable. It is the best place we have ever stayed and in very nice surroundings. Everything in the accommodation was perfect and spotlessly clean. We have recommended it to friends and we will return. Message: I first discovered this little gem a few years ago and have been back many times since. Relaxing, comfortable, stylishly furnished and maintained with great care, Applehay Studio has become my favourite bolt hole. Although close to the owners house, it's private and cosy - a perfect retreat in a glorious location. And now it's just got even better with the opening of the new village stores a few yards away, you don't even need a car. The shop is well stocked, sells good wines, daily papers, good breads and excellent pastries. A little over two hours from leaving London Waterloo, I was sitting in the garden with a glass of wine, watching the flowers grow. What a treat. Message: This is just a lovely place to stay! The setting on the village green is stunning and the accommodation is spotlessly clean and very well thought out with tremendous attention to detail. Alan and Jo, the owners of the cottage, live next door to the Studio and are very friendly and really take a lot of trouble to ensure that everything is just right. When you arrive there is always a bowl of fresh fruit, tea, coffee, fresh milk and fresh flowers. They are around if you need them, offering ideas for excursions and providing local knowledge. We have stayed at Applehay a few times now, both on a B+B basis where Jo provides a lovely breakfast, and on a self catering basis and we really appreciate the flexibility they provide. It's not like most self catering cottages with their rigid Saturday to Saturday booking requirements nor is it like a standard B+B where you often feel as if you are living in someone else's house. The Studio is the best of both worlds and I would say it is really unique in the area (we've tried a few) for the combination of quality of accommodation, value for money and excellent service. We'll be back!